Antennas: The More the Merrier? With all of the praise given to our AC3200 Ultra Series Wi-Fi Router and its devilishly good looks, we thought we ought to take a moment to talk antennas. After all, this router features six of them, and they’re not exactly small. So what’s the deal? How do these high performance external antennas help to keep your devices connected with stronger Wi-Fi coverage? A number of factors play a part. First and foremost, the AC3200 Router features Smart Beam Forming to send focused beams of bandwidth directly to your devices rather than simply emit a donut-shaped ring of bandwidth. Aside from Smart Beam Forming, though, the AC3200 Router is able to provide premium wireless connectivity because of its 3×3 wireless configuration. What does 3×3 even mean? So what are the main benefits to having multiple antennas? Speed and reliability. While many dynamics play a part in affecting Wi-Fi speed, one of the main factors is the number of antennas a router has, and by extension the number of spacial streams it can communicate over. Rather than a router and client only being able to transmit a single stream of data between one another, as is the case with a 1×1 SISO router, 3×3 routers are able to send and receive data over three spatial streams, tripling data rates. Here’s a real-life example. 802.11n routers have a maximum data transfer rate of 150Mbps per spacial stream. So a 1×1 Wireless N Router has a maximum theoretical speed of 150Mbps. Give that same router 3×3 MIMO capabilities and its maximum theoretical speed triples to 450Mbps.Wireless AC routers take it one step farther. 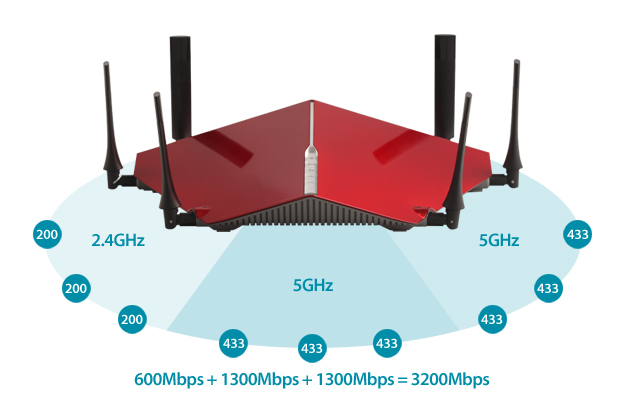 802.11ac routers have a maximum data transfer rate of 433Mbps per spacial stream on the 5GHz band, so a 3×3 11AC router has a maximum speed of 1.3Gbps. So why is it called the AC3200 Ultra Series Wi-Fi Router? 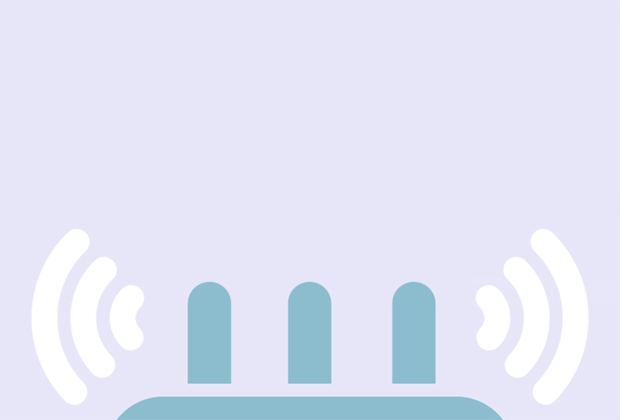 Because a router’s antennas are physically located different places on the device, they each receive a sliiiiiightly different version of the signals sent by connected clients. This is called spacial diversity and it helps to improve link reliability. Once each antenna has received a signal, the router algorithmically combines the different versions to create one better version. Think of it this way. Since the AC3200 Ultra Series Wi-Fi Router has three receiver antennas, it’s like having three witnesses to a crime versus just one. If you’re relying on just one account of what happened, and your witness misses a key detail, you’re out of luck. With three witnesses, you can combine all of their stories to get a fuller, more accurate understanding of what happened. Routers, clients & future-proofing your network! One thing to note is that wireless clients, like wireless routers, also have transmit and receive antennas and the number of spatial streams utilized will always be limited by the device with the lowest number of supported signals. 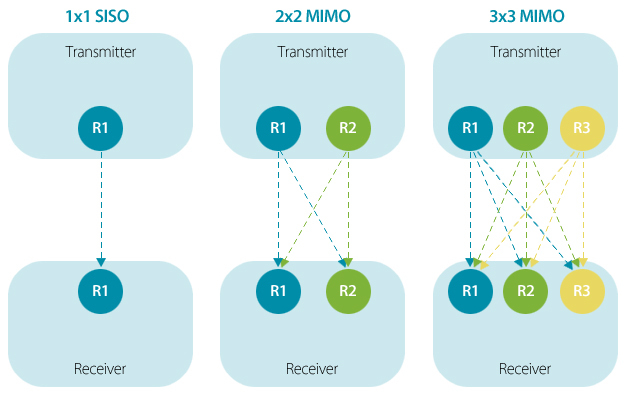 That means if your router supports 2×2 and your phone only supports 1×1, your phone won’t be able to take full advantage of your router’s 2×2 MIMO configuration. 2×2 Wi-Fi Routers account for the majority of routers on the market today, which is sufficient for most connected devices (iPhones are 1×1, many laptops are 2×2), but with the introduction of 11AC Wi-Fi, the market is moving and you’ll start to see many more 3×3 devices introduced. SO, if you’re looking to upgrade your router, a 3×3 option like the AC3200 Ultra Series Wi-Fi Router is a great way to go.